This model runs in OpenCell and COR and the units are consistent throughout. The CellML equations are consistent with the published model, but the CellML model does not recreate the published results for unknown reasons. ABSTRACT: Diabetes is a disease of the glucose regulatory system that is associated with increased morbidity and early mortality. The primary variables of this system are beta-cell mass, plasma insulin concentrations, and plasma glucose concentrations. Existing mathematical models of glucose regulation incorporate only glucose and/or insulin dynamics. Here we develop a novel model of beta-cell mass, insulin, and glucose dynamics, which consists of a system of three nonlinear ordinary differential equations, where glucose and insulin dynamics are fast relative to beta-cell mass dynamics. For normal parameter values, the model has two stable fixed points (representing physiological and pathological steady states), separated on a slow manifold by a saddle point. Mild hyperglycemia leads to the growth of the beta-cell mass (negative feedback) while extreme hyperglycemia leads to the reduction of the beta-cell mass (positive feedback). The model predicts that there are three pathways in prolonged hyperglycemia: (1) the physiological fixed point can be shifted to a hyperglycemic level (regulated hyperglycemia), (2) the physiological and saddle points can be eliminated (bifurcation), and (3) progressive defects in glucose and/or insulin dynamics can drive glucose levels up at a rate faster than the adaptation of the beta-cell mass which can drive glucose levels down (dynamical hyperglycemia). 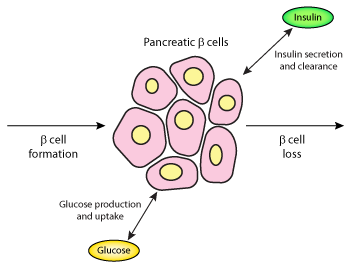 Schematic diagram of the pancreatic beta-cells. Glucose is taken up and produced in response to insulin secretion and clearance. Beta-cell formation and loss represent the rates at which beta-cells replicate and die. Derived from workspace Topp, Promislow, Devries, Miura, Finegood, 2000 at changeset 0b82d5ca266a.